Being old doesn’t mean you can’t learn new tricks. Just ask German manufacturer Claudius Peters – that’s a company*, not a person — which is in its 113thyear of operation. It is in the perhaps unglamorous business of providing machines and process plants for cement, steel, gypsum and aluminum producers. Hulking plants for cement production don’t immediately conjure thoughts of a nimble, digital-age business. But in the past few years, Claudius Peters has been retooling itself for the 21st-century so it can out-innovate its competitors. Retooling involves literally using new tools, as in new types of software for designing and collaborating, but it also means changing mindsets. Just ask Thomas Nagel – that’s a person, not a company. As the Operations Director and Chief Digital Officer for Claudius Peters, he’s charged with bringing new efficiencies to the business. That means instilling a spirit of innovation among his team and leading a transformation to new digital tools and workflows. 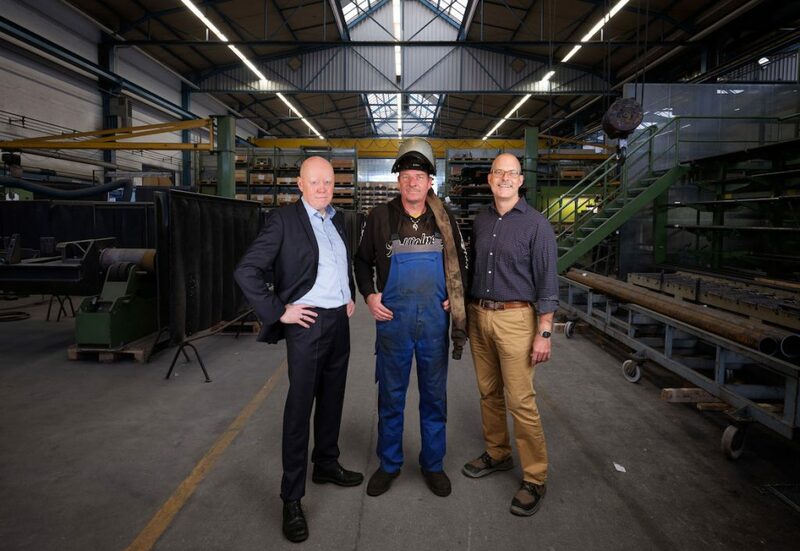 Thomas Nagel (left) at Claudius Peters in Buxtehude, Germany, along with welder Volker Henke and Autodesk Fusion 360 Evangelist Mickey Wakefield. “The main goals of our digital transformation, our Claudius Peters innovation journey, is to develop solutions for the customer for less costs, within shorter lead times, with a higher quality in each single project phase we are in, and also to increase customer satisfaction,” Nagel says. Having started using Autodesk digital design software in 2007, 101 years after the company’s founding, Nagel catapulted his team forwarded again in 2017 with two new initiatives that represent their digital transformation. One was using generative design in Fusion 360 and the other was using cloud-based collaboration in BIM 360. Both efforts encountered some early skepticism, but Nagel’s team quickly saw the benefits of each technology and became adherents. In 2017, Nagel was in the audience at Autodesk University in Las Vegas watching a presentation on generative design when he had an a-ha moment. While watching the technology being used to optimize Dutch residential neighborhood configurations, he saw an opportunity to use it in a very different way: to improve a crucial part in the company’s Clinker Coolers. Clinker Coolers are half-football field-sized mechanisms that cool molten rock (the “clinker”) from 1400°C down to 100°C (2550°F to 212°F) during the production of cement. The transport bottom for the conveyer system in the diagram below must be really sturdy to do its job. But Nagel and his team knew the part could be made lighter and smaller to reduce cost and material use. In fact, they had already taken a stab at redesigning the part and cut between 30 and 40 percent of its weight. Internal diagram of the ETA Clinker Cooler. Courtesy Claudius Peters. They doubted that generative design could do much better. They had already taken a 168 kg part down to about 80kg. But they embraced the challenge, and after just a few hours training with Autodesk Fusion 360 Evangelist Mickey Wakefield, they ran the test in Fusion 360. Design options including the “alien part” (farther right) produced by Autodesk’s generative design software. The original part, which had previously been optimized using traditional approaches, is at top. Courtesy Claudius Peters. “The team seemed completely surprised, disbelieving, confused. Could it be that the requirements, constraints were entered incorrectly? Why is the part so different from what we designed?” Nagel recounts. After the initial shock, the team got practical. The “alien” design would require 3D printing, which was not a production method for Claudius Peters. But the team figured that they could implement key elements of the generative designs in a way that could be fabricated through casting and welding. Taking this approach, they came up with a prototype part that was 70 percent lighter than the original. Left: “Reverse engineering” the alien part into a weldable design. Right: The original transport bottom part (with tablet resting on it) and the new part, based on generative design. The new part is 70% lighter. Courtesy Claudius Peters. In the end, the team settled on a design that reduced the part’s weight by 20kg through material reduction. The new design also translates into €100 savings per part. Because there are often 60 to 100 of these parts in a clinker cooler, that weight and cost savings make a big difference. The resulting impact on price is a competitive advantage for Claudius Peters, whose big customers in China and Europe are highly cost conscious. Learn more about how generative design can impact your business. There are other business and environmental benefits as well, a key concern since cement production is a major source of carbon dioxide emissions. 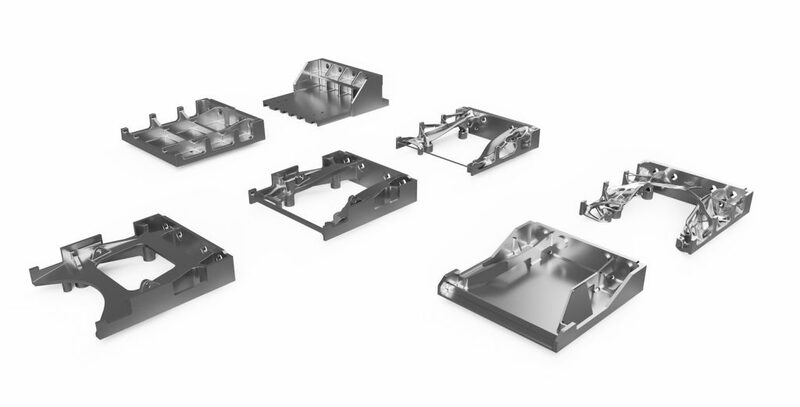 “With generative design, we replaced a heavier part which was casted in a foundry in India or Turkey and moved to a lighter part which can be welded here in Buxtehude [Germany], in our workshop or nearby. So we’re saving energy since we won’t have to transport parts from India to Buxtehude for assembly, and that also saves transportation time,” says Nagel. *The company was originally named for its eponymous founder, Claudius Peters (1875-1957). Beyond rethinking the design of individual parts, Nagel also saw an opportunity to better manage the design, planning and assembly of whole plants themselves. To improve this process, specifically the reporting and tracking of issues, Nagel again found inspiration at Autodesk University 2017. When he returned to Germany, he started a small pilot with a few people using Autodesk’s construction management software BIM 360 instead of their cumbersome old spreadsheets-and-email process. The benefit – having a cloud-based single source of truth updated in real-time — was obvious to the team and it caught on quickly. The team didn’t stop internally; they brought their customers into their BIM 360 process as well. “Compared to our old way of working, the workflow with BIM 360 creates more direct contact between us and our customer. We don’t need to write several emails. We are able to directly communicate, and everyone is on the same page immediately,” says Lars Heidler, lead engineer at Claudius Peters in Buxtehude. 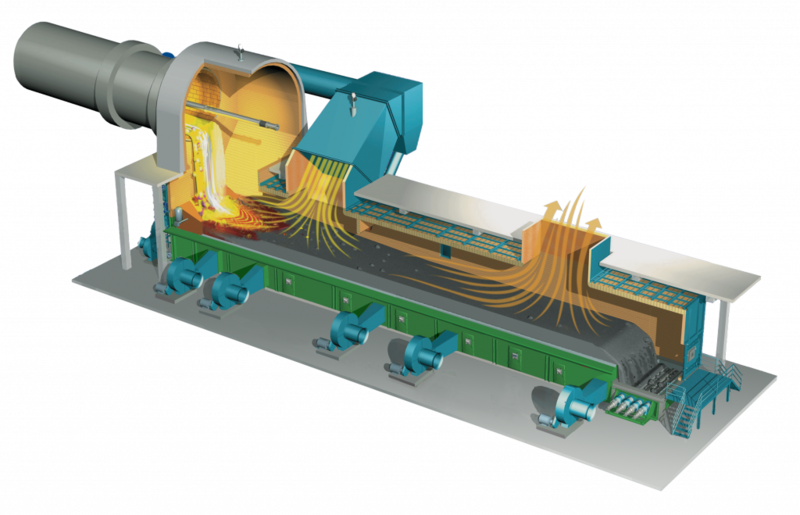 Lars Heidler examines the mill portion of a calcination plant with the aid of BIM 360. Previously, only one design engineer had access to the digital models in Inventor. Now, everyone can annotate the model directly in BIM 360, so communicating problems or changes is much faster and more accurate. “We now have 200 people online on the platform. 150 employees of Claudius Peters and 50 external people — mostly customers, but also suppliers. We now process every major order in BIM 360. 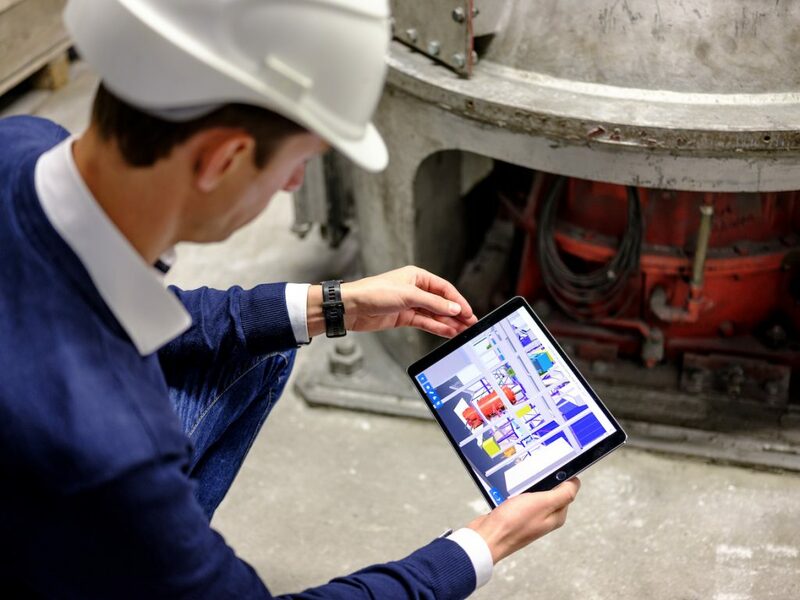 60 to 70 percent of all quotations for plant projects are also optimized with the help of BIM 360 in the sales phase. We now have more than 100 projects on the platform,” adds Nagel. That explosive growth didn’t happen without some resistance to change from employees and customers. But Nagel had a secret weapon: student interns from the Hamburg University of Applied Sciences. They acted as project administrators and helped facilitate the introduction. Within a few weeks, another problem emerged. “My colleagues were afraid that I would take it away again. We test new software solutions often, but we don’t adopt everything,” says Nagel, so there was concern that the BIM 360 pilot would just be a short-lived trial. Needless to say, he didn’t take BIM 360 away. It’s now firmly part of Claudius Peters’ plant design and commissioning process from the get-go. Learn how you can use BIM 360 to streamline your work. “Today, when we are starting a new project, we are normally starting with a 3D scan of the existing plant and these contain huge amounts of data that need to be transferred….We are able to upload this huge amount of data from all over the world directly to the BIM 360 platform – it could be a 20 gigabyte file from China – and the design engineer here in Buxtehude can immediately start to work with this 3D scan,” says Heidler. Nagel notes that his team hasn’t measured how much time BIM 360 has saved them because they haven’t gone back to the pre-BIM 360 way of working to compare projects side-by-side. But he estimates that it’s hundreds of hours per project, possibly as much as 20% of time spent. Having reaped the early gains of generative design and cloud collaboration, Nagel is nowhere near done. The Claudius Peters team is bringing their generatively designed clinker cooler parts to market later this year, and they are actively looking at dozens of other parts to apply the technology to. BIM 360 use is entrenched and expanding. And Nagel has his sights on the century ahead for his company.